It's Doctor Who week on The Baker Upstairs! I usually try to limit the sharing of my nerdliness on the blog, but I'm so excited about the Doctor Who premiere this Saturday! And when I found this awesome cookie jar on Amazon, I knew Doctor Who week was meant to be. 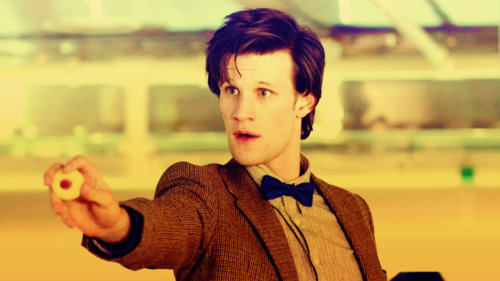 If you're not a Doctor Who fan, you should be! I think it is one of the most brilliant TV shows ever made. And I feel like with each season, it just gets better and better! The gist of it is that the main character, known only as The Doctor, has a blue police box (called a Tardis) that allows him to travel through time and space. He picks up different companions in different seasons, and the doctor himself can regenerate (which means he can be played by different actors). I'll confess that I haven't watched many of the older episodes (the ones made pre-2000's) but I've loved the show since the Christopher Eccleston/Billie Piper days. Nowadays, the doctor is played by the hilarious Matt Smith, and I think he's great! 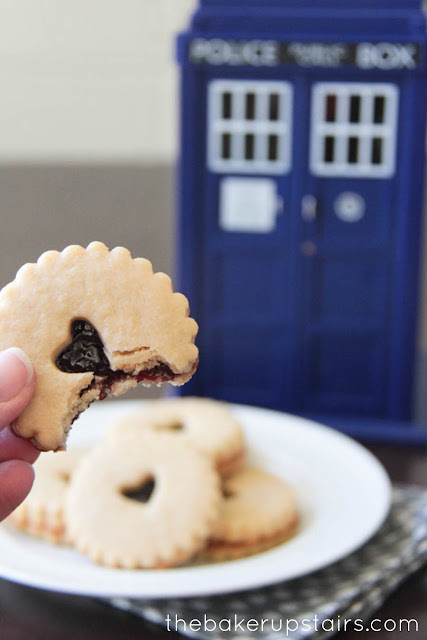 To add to his charm, he's really the first doctor that has expressed any food preferences at all, which means that now there are Doctor Who-themed foods to eat! 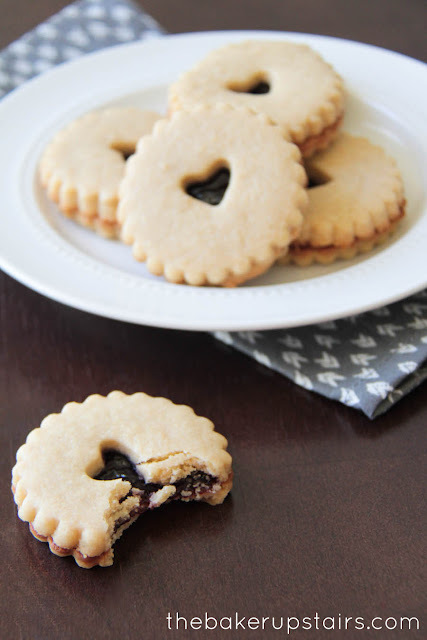 We've found packaged Jammie Dodgers at World Market before and enjoyed them, but I was excited to try a homemade version. They turned out awesome! They have all charm of the original cookies, but with more depth of flavor, and a more delicate texture. They're really just shortbread sandwich cookies with jam in between, but I think it's much more fun to call them Jammie Dodgers! 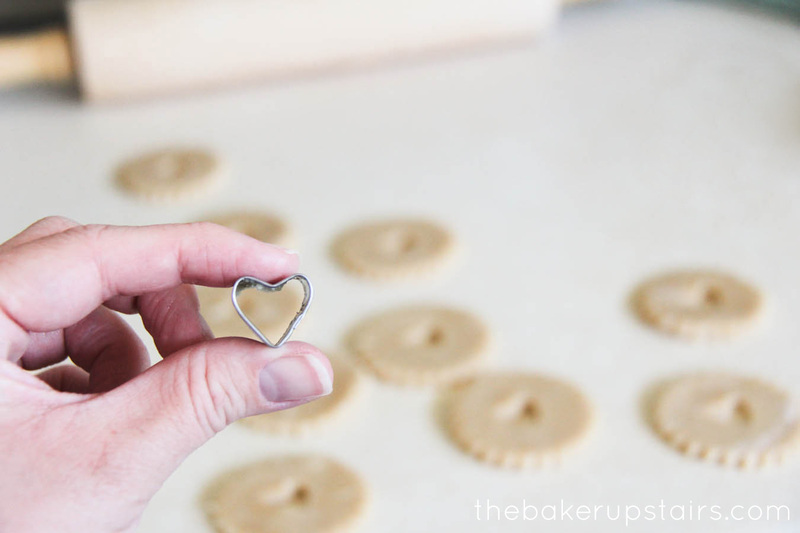 And the fact that you need a teeny tiny little cookie cutter to make them just makes them all the more sweet. I found my tiny heart cookie cutter at Joann's next to the cake decorating supplies. (I think it's actually supposed to be a fondant cutter.) It worked perfect for the cookies, though! These cookies are seriously delicious, and would be fun for any occasion (not just a Doctor Who-themed party). I think they'd be awesome for a little girl's tea party, or with hot chocolate at Christmastime. Enjoy! Preheat oven to 350. In a large bowl, mix together the flour, sugar, and salt. Cut in the butter until the mixture resembles coarse crumbs. Whisk together the egg, egg yolk, and vanilla, then add to the dry mixture and mix until a soft dough forms. Wrap in plastic wrap and chill in the fridge for 15-30 minutes. Roll the dough out on a lightly floured countertop, and cut into circles (I used a fluted biscuit cutter that was 2 inches in diameter). Using a small cookie cutter (or an apple corer) cut a small shape out of the center of half of the cookies. Bake 12-15 minutes, or until very lightly browned on the bottom. Let cool slightly, then spoon about 1 teaspoon of jam onto the bottom halves of the cookies. Top with the other half, and put back into the oven for 5 minutes to set the jam. Let cool 15-20 minutes before removing from the pan. 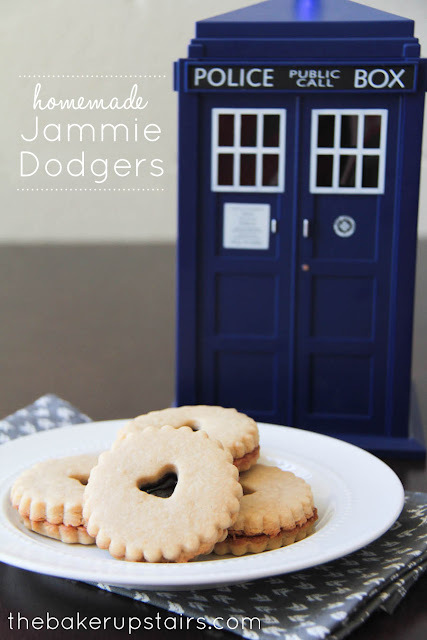 I haven't had a jammy dodger for years - I really want want now! Yours look perfect! My daughter's and I made these today. Absolutely sinful!!! We had PG tips tea and ate our fill of Jammie dodgers. This is going to be made all the time now. Thanks!!!!! Tip from the UK! : if you buy the cheap seedless, lumpless jam, you know the set kind and heat it before spreading, then it will be 'chewier' like the original jammie d. Or make raspberry jam caramel. You said that you haven't watched the older episodes, but I know that Tom Baker's Doctor was obsessed with Jelly Babies, if you'd like another Whovian treat to add to your snacks! So excited to find this recipe! We were able to import some Jelly Babies for the 50th Anniversary episode but couldn't find Jammie Dodgers anywhere! I used This recipe: http://www.dianasdesserts.com/index.cfm/fuseaction/recipes.recipeListing/filter/dianas/recipeID/783/Recipe.cfm yesterday because I'd neglected to bookmark your recipe awhile back. The ones I made had a terribly stiff dough to roll out. So stiff that I only used half of it and the rest is in the fridge awaiting patience and upper body strength recovery. I may have been too careless with flour measurement. How stiff and crumbly would you say YOUR dough is? We are big Dr fans plus they are SO pretty for holiday platters I'd love to make more today but the other dough has beaten me. LOL I used my Wilton's Linzer Cookie Cutter for these cookies. Fun to play with and a choice of 6 center motifs. Under $10 to purchase. My dough was pretty soft and easy to roll out. I think it can vary based on altitude and humidity as well, but the dough was very easy to work with for me. I can't remember exactly, and it depends on what size cutter you use, but I think it was somewhere around two dozen. I used a fairly large cutter, though, so mine were bigger than the jammie dodgers you can buy in the store. What kind of flour: plain or self-rising? 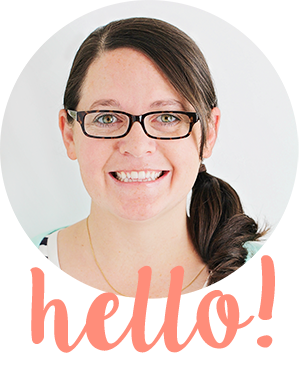 I tried a different recipe before finding yours - which I'm trying today. But in the other recipe, the cookies lost their shape as they baked. What causes, and what prevents, that from happening? Thanks! I couldn't say for sure, but I'm guessing it's related to butter temperature and/or the amount of flour that has been added to the dough. In this recipe it's important to make sure the butter is cold when cutting it in. The only change I'd recommend? I'd have had 2 hearts cut out, given our Time Lord's anatomy. Yumsies! I can't wait to test this recipe! Just made a batch to test out for an upcoming Doctor Who party my sister and I are having. They turned out wonderful! 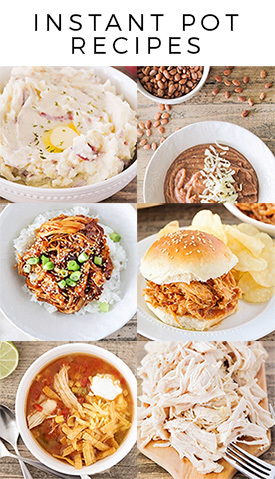 Great recipe, delicious results! Fantastic!